It was cold, it was windy and it had hills. My coach told me to do this ride regardless of the weather and not to cut down my distance so I could take it easy on my 40th birthday. He has no compercy – compassion or mercy. These are just the types of traits I fancy in a coach. It took me about an hour to drive up to the park and find an appropriate place to park. When I began my ride, it was very windy and only 49 degrees. From where I parked, the ride began with a quick 2 mile decent. Over the course of the day when descending this hill my speed would clock between 38 – 44 miles per hour. I probably could have gone faster, but the wind was ferociously pushing against me. I was afraid to stay in an aero position as the wind gusts easily blew me from side to side on the road. I could hear the wind whistle through my spokes when strong cross wind blew. The roar of the wind was literally deafening and you could feel the air pressure build in your ears because of the sudden and steep descent. As soon as I reached the bottom, I had to do a 180 degree turn. Within a span of a few seconds, I went from bombing down the hill at 40+ miles per hour, with my eyes tearing, my face wind burned and my ears aching, to absolutely silence and a crawling pace as the wind move behind me and I started to climb a steep section of road. It was a bit dizzying. Overall, the park was very empty. Minimal traffic and only a handful of other cyclists. Later in the day, I did see a bunch of adventure racers on mountain bikes. The cool temperature in the park and overcast sky made it feel more like fall than spring. This suited me just fine as I prefer the fall to spring. I passed several streams and lakes along the loop and got used to the sound of a woodpecker at one spot and the smell of a dead skunk at another. 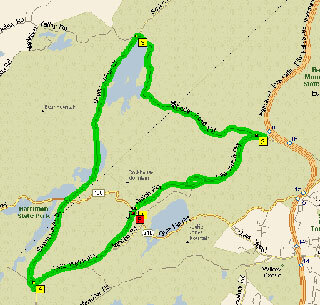 The 14.1 mile loop was a continuous series of slow climbs moderate descents and occasional flats. All totaled I was out in the elements for 6 hours flat, covering a distance of 100 miles. The ride got difficult towards the end and I could see my average speed decreasing. I couldn’t tell if the wind had picked up or if I was just getting tired.